Goals where swapped back and forth in a match where hosts China PR met reigning champions Korea Rep. with China PR coming out on top 3-2. The local supporter’s cheers rang out through Yongchuan Stadium as they got the result they had hoped for. China PR, who made the final 8 at last September’s FIFA Women’s World Cup in China, displayed a positive attacking spirit right from the off. This included taking the opposition on 1 vs. 1 and strongly attacking the goal. It was left to the Korea Rep. defenders YOO Young Sil, who entered as a substitute, and captain KIM Yoo Mi, to cut out the final passes up front. China PR then started playing long balls ahead into a post player who looked to lay it off. In the 11th minute KIM Yoo Mi had a fierce left footed shot from range and in the 14th CHA Yun Hee’s through ball on the right found PARK Hee Young who managed a left footed shot on goal. China PR on the other hand relied on HAN Duan, who plays with a fast, physical style, to create chances. In the 24th minute she broke on the left and in the 32nd minute she played a wall pass and went on to shoot but a goal was not forthcoming. Up until extra time at the end of the first half China PR were unable to break the defenses of Korea Rep’s former golden glove goalie KIM Jung Mi. But in the 45th minute a set piece led to the opening goal. BI Yan’s left sided free kick was sent back in by YUAN Fan and HAN Duan was waiting in the middle to finish with her right foot. The half ended with China PR in the lead 1-0. The second half saw both teams making one substitution each. In the 53rd minute LIU Yali’s precise cross was met by HAN Duan in the air and led to recent entrant ZHANG Ying to have a left footed shot from the right side. However in the 59th minute Korea Rep opened up China PR’s defenses and tied the game up at 1-1 thanks to a PARK Hee Young header. Then against a fading China PR, Korea Rep. poured down the left side, HAN Song I supplying PARK Hee Young who turned and unleashed a left footed shot. The ball deflected off a defender’s foot, and snuck into the goal. 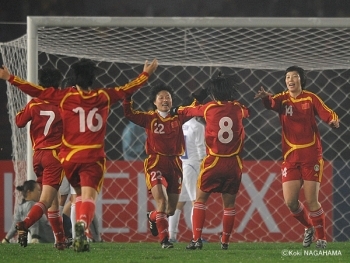 The Korea Rep. team burst into celebration, having turned the game around in just 8 minutes. But the home side still had enough left to not accept defeat. In the 70th minute the left full back LIU Yali’s pass found XU Yuan who beat a defender and shot with her right foot. In the 76th a long ball from the back was controlled well by substitute GUO Yue. The Korea Rep. defense was battling well but China PR started using the space behind the defenders on both sides. The able Korea Rep. defense couldn’t hold out the attacking China PR team forever though and in the 78th minute gave up the leveler. A shot from a left sided corner kick hit the cross bar and HAN Duan leapt to get the ball into the goal for the leveler. The sudden added support from the awakened crowd pushed the China PR players to continue pushing forward. In the 86th minute HAN Duan’s fierce volley hit the cross bar. GUO Yue's shoot hit on the cross bar, then The rebound was headed back in by XU Yuan for the go-ahead goal. Korea Rep. attacked in extra time down the side but were unable to break through China PR’s central defense and the match finished 3-2. China PR at the previous tournament had one draw and two losses so this result marks their first victory at the East Asian Women’s Championship Finals. Leading China was coach Elisabeth LOISEL, she said “There were some nervous moments in the first half, but we were especially strong from free kicks. Also, I was very impressed by our defenders”. On the other hand, losing Korea Rep coach AN Ik Soo said “Overall we weren’t bad. There are some detailed areas we need to improve but in the end I felt some of China’s win was based on luck”.